A deaf person or someone with hearing loss can see all the visual information in a Web site, but will not be able to hear any audio content. Audio information should be presented in video captions or an alternative text transcripts for someone who is deaf or who has a hearing loss. The following interview with Prof. Nuria Sagarra is captioned. You can access captions by clicking the arrow button in the lower right corner of the screen. Some users may not be able to find one of several volume controls to enable audio or audio may be disrupted. All users may need captions if the original audio quality is poor. 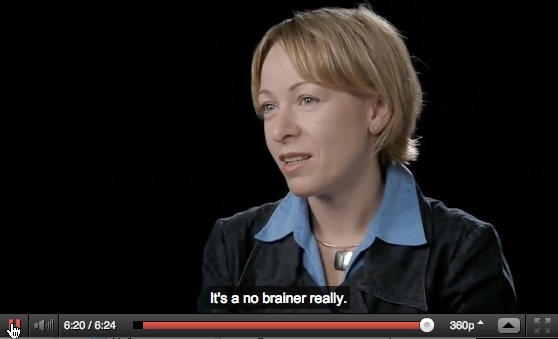 Non-native speakers of English often use captions to help understand content. Some users may not have access to headphones, and it is very common to mute audio in public computer labs or common work spaces such as the library. It is particularly important among many in the Deaf community to distinguish the condition of not being able to hear from the culture created and shared by sign language users. Deaf– Deaf with a capital “D” refers “to a particular group of deaf people who share a sign language, such as American Sign Language (ASL), and a culture based on the use of that language. See (National Association of the Deaf FAQ) for more information. deaf – lowercase deaf refers to the audiological condition of not hearing (National Association of the Deaf). hard of hearing – refers to partial hearing loss. This term is preferred by many with partial hearing. hearing-impaired – This term should be avoided since many in the Deaf or hard of hearing community feel it emphasizes a lack of ability. Sign languages are considered to be separate languages with different grammatical structures and conventions from spoken languages. Although finger spelling may be used to translate spoken words into sign, an actual sign language speaker relies on many more gestures to speak. Some may have cochlear implants to enable partial to almost complete hearing. Note: Individuals with cochlear implants may still need particular accommodations including captions. Others use American Sign Language (ASL), a language composed of hand gestures and facial expressions, or other sign language. What does this cultural difference mean to the concessions needed to support these individuals? This means written English is a second language for some. So, one must be aware, many ASL signs do not always translate directly to the English language. An important thing to clarify is “Deaf” with a capital “D” is recognized as referring to the culture or the Deaf community. Speaking Sign Language is comes with colloquial signs and regional dialects. Much like accents, or British culture in comparison to American culture. There is actually an American Sign Language and British Sign Language to continue this example. So, remember to respect Deaf culture as you would respect all cultures and their diversity. Do not grab an arm or touch someone, this may startle the person. If you would like to gain their attention, tap on a surface near them. Tapping on a shoulder is acceptable, also. A person who is deaf will feel the vibrations and look in the direction of the disturbance. Remember, a person who is deaf uses other senses to communicate and interact in the world. Speak to the person, not the interpreter if one is present. How you acknowledge a person affects how they feel. The next time you have a conversation, think about how eye contact with a person or the lack of eye contact the other person maintains with you, feels to you. Maintaining eye contact in an American culture offers a sign of respect and notifies the other person of a subtle sign of attention, understanding, and other conversational cues. This is especially heightened for a person who is deaf. If you are making eye contact with the interpreter, the person who is deaf may feel excluded or ignored and not part of the conversation. Use the words, “I” and “you” when an interpreter is present. Do not say, “Tell him or her” or “Does she get it?” You are not communicating to the interpreter. Do not make assumptions of capability. Sean Forbs won the 2013 Outstanding Hip-Hop Artist/Group DMA award. This Modern day Deaf music artist has been deaf since he was one year old. Do NOT ask if a deaf person can read and write. If there seems to be issues with writing content, recommending a writing tutor as occurs with those who speak English as a Second Language (ESL) students who orally speak other languages is acceptable and encouraged. Remember, sign language is a visual and conceptual language, which does not always translate verbatim to written languages. This can become an issue with specialized subjects or technical writing. Carefully confirm content language if an interpreter is present. This issue of confirming content language with an interpreter falls to both the student using the interpreter and to the teacher, mutually. This is very important when discussing content language that has NO translation to sign language. An example where this may become an issue is in specialty fields using higher complex math equation or specific technical engineering language. Allow a student who is deaf or hard of hearing to select a seat for the best view of someone speaking or view of the projector and speaker. Allow for hands-on participation if there is time for this form of class activity. Also, face a student and limit pacing. Facing and speaking to the students instead of speaking while writing on a whiteboard/chalkboard with one’s back to the audience, is helpful for those trained to read lips or those with various hearing impairments. Maybe using a projector or a slide projector remote to allow you to project information and speak in the direction of the class can be arranged. Technology is there to help students learn and the teacher to teach more effectively. Using a piece of paper or writing to speak is perfectly fine if you are unable to use sign language. Check if there is a need for a note taker or other options to be arranged. Repeat questions and or statements in class. Furthermore, allow participation and verification of content. When asking the class if there are any questions, simply making eye contact for a visual cue may be sufficient. Audism is a belief that the ability to hear and orally speak is superior to not hearing and using sign language. Audists are those who believe in Audism and these believers may be deaf or not deaf. Audism is comparable to racism and sexism in the Deaf community. Internalized/dysconscious audism- audism that occurs within the deaf community. This is a complex issue within Deaf culture. It reflects various opinions about those who are deaf and his or her choices to obtaining cochlear implants, learning both English and ASL, learning to speak or read lips, and other situations.